You need support built on experience and broad insights. 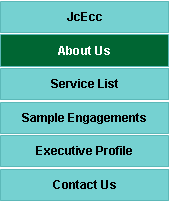 JcEvers Consulting Corp provides consultative services to organizations that need to gain additional business value through the effective systems use; effective technology encompassing IT Strategy, IT Management Processes, Business Applications and Organizational Design. Advisory services: Many clients find that they need the structure and insights our services provide. They know that their team can do more. They need the facilitation and insights to see how to best direct it. Leadership services: Clients have multiple initiatives underway. Finding the right person to complement your team during a peak in demand can be daunting. Our program and project management framework enables clear goal setting, status reporting and risk mitigation. ERP market experience: With over 30 years of ERP experience, our clients find our insights spanning multiple ERP vendor products to be valuable. Selecting and installing an ERP package should not be the goal. Implementing a sustainable business value solution needs to be the mission. Broad client base: No matter what the industry, technology and the people around it have the ability to enable market differentiation and efficiency. We’ve worked heavily in public sector (municipality, provincial, education, associations) as well as professional services and manufacturing. Our experiences and solutions are proven in each sector.